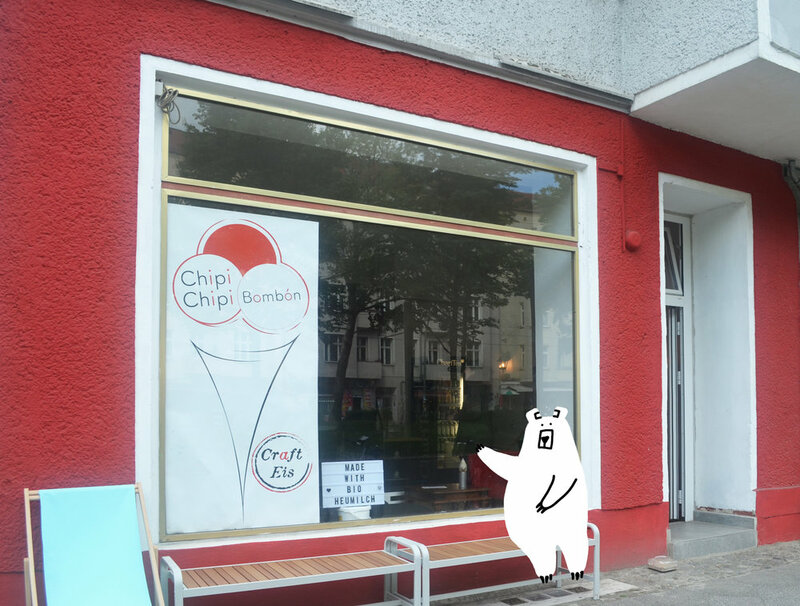 If you happen to be in the cozy area of Friedrichshain, don't miss out on the ice cream crafted with care at Chipi Chipi Bombón, from Italian classics to South American traditions. Whether you're tasting dulce de leche, fior di latte, pistachio, or sweet potato, it's a guarantee that you would leave with a smile on your face and a desire to come back. We met and sat down with Andrés, the owner of Chipi Chipi Bombón, who let us in on his journey of creating the ice cream you won't forget about. How has your life experience helped you decide on becoming an ice cream maker? Andrés: I’ve always loved art. I used to be a photographer, a tango teacher and now an ice cream maker, so in a way I’ve always stayed close to art as much as I can. I’m from Argentina and I’ve lived in Israel, the US, Ireland, Italy, and now Germany. I was working in tango when I was living in Rome, but it didn’t work out so well in Berlin. It struck me when I was back in Argentina for vacation that I might have lived in Europe for so long, I almost forgot that I’m Argentinian, and I should be open to new opportunities. The economy in Argentina has been unstable for decades, so in order to survive, Argentinians have to adapt really fast to changes. I'm actually not a fan of sweets, but I love tiramisu and ice cream. I like that there are so many ice cream stores in Berlin, though no one was making ice cream similar to the way it's done back home. Since there is a big Italian immigration community in Argentina, the ice cream we have there is old Italian style. So I thought what if I could bring this kind of ice cream to Berlin, and that’s when I realized I need to learn how to make ice cream! Knowing there’s so many details in where to source the ingredients as well as measuring the ratio of ingredients mix, how did you learn all the nitty gritty of ice cream making when you have no previous experience? A: Basically I started by googling and reading books on how to make ice cream. Luckily, a friend lent me an ice cream machine he had for me to try, saying if it works, I could get a better one, and if it doesn’t, I wouldn’t have spent any money on getting a machine. The first results were ok, but I started to get into it more once I was actually making ice cream, and I went on to read more about mixing and the different aspects of ice cream making. I found it interesting how you can play with the flavors using the chemical reactions of the ingredients mixing together. It was after playing with it for a while, and hearing positive comments from friends and seeing their eye opening when they tried my ice cream, did I decide it was time to start a business. The process of learning how to make ice cream from scratch to knowing I have a good product to sell took about 2 years. What do you think is important to make good ice cream? A: One thing I find important for good ice cream is tasting the ingredient of the main flavor, similarly to before it was made into ice cream. For example, if you’re having pistachio ice cream, then you should feel like you’re actually eating pistachio, but in the shape of ice cream. When people come in the shop and tried my banana ice cream, they said it tasted like bananas, but in fact it is bananas! I don’t use puree or powder, instead I use fresh fruits, so you are actually tasting the fruits when you have the ice cream. Actually there are 40 kgs of bananas sitting in the back of the store, waiting to be transformed into ice cream. For example, I had a similar sensation when I had an amazing ice cream shop in Italy, where I tasted their apple ice cream. It was exactly like eating the apple in the form of ice cream, and I knew this is the sensation I want to provide people when they try the ice cream I make. So, when I’m experimenting with new flavors and having people try out, if I don’t see they go “woah” and have their eyes open widely, I won’t serve it in the shop. It’s interesting to see classic flavors like strawberry and chocolate right next to flavors so different like sweet potato. Are there flavors that are influenced by the Argentinian culture and such? However, it’s dulce de leche that brings us home, since it’s the most loved flavor in Argentina. It’s the top 1 ice cream flavor being sold the most in Argentina, even more than the 2nd, 3rd, and 4th combined together. I love to see the Argentinians coming in for the dulce de leche ice cream, and to hear they say it feels like home. What are things you see the shop will be doing more of in the future? A: Some of my goals are to open more shops in different parts of Berlin and to be able to deliver ice cream to the whole city. We’ve been working with Foodora, but I’d like to establish my own delivery system as well. Foodora only delivers within 2 kilometers radius, whereas last summer when I worked with my own drivers, we managed to deliver to as far as 4 kilometers. People were quite skeptic about ordering ice cream delivery at first, but our containers are designed well so the ice cream can actually maintain at perfect condition upon arrival. The shop stays open in the winter and we have people ordering ice cream from their homes! It’s quite amazing to see people coming to the shop all covered in their coats, yet they still enjoy the ice cream as long as it’s indoors. Andrés, the craftsman who delivers moments of joy in the form of ice cream. What gets you excited nowadays? A: Doing this! Running this shop gets me excited, and the reactions of people after they taste the ice cream also get me excited. The other day there was a woman who started to get teary after she tried the dulce de leche ice cream, because it reminded her of home. Also, since I make the mate ice cream with milk base, the Argentinians tell me it tastes like what grandma used to make them as a kid, serving mate with milk and sugar instead of water. I appreciate hearing those comments and being able to evoke those emotions.